Central Alberta. A region that has about 80 golf courses, Central Alberta is the destination to be for professional golfers who would want to enjoy the sport. Calgary. This region was once chosen to host the 2009 CN Canadian’s Women’s open due to its spectacular terrain and golf courses. Eastern Alberta. Here you have the choice of over 40 golf courses that are well maintained and classy. Greater Edmonton. Once hosted the 2006 CN Canadian’s women’s open. Northern Alberta. Holds over 40 golf courses. Southern Alberta. There are numerous golf courses here at the lower part of Alberta that one can enjoy playing on. Western Alberta. Known as the Rockies, you will definitely have fun in this region when it comes to the golf sport. 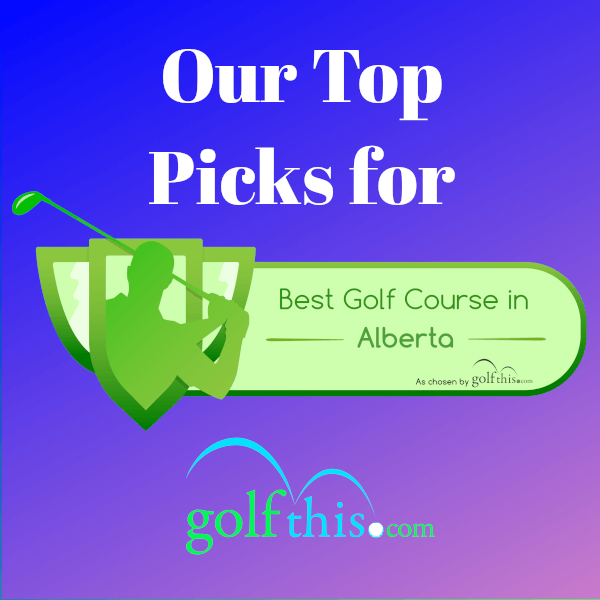 In this article, we will focus on 10 of the best golf courses in Alberta. This will give you some pointers on just where you would need to go if golf courses is what you are looking for. Set up in the Canadian mountains of Alberta, Jasper park lodge has an exquisite and elegant golf course that is almost unmatched in the world. The view from this place is the first thing that is sure to catch one’s eyes. With the appearance of beautiful snow-capped mountain peaks and stunning views of the lake, the park is set in an incredible environment that not only gives the golfers the fun while playing but also gives them the chance to enjoy the environment they are playing in. To both professional and amateur golfers, this is definitely the place to be. There are a number of reasons as to why this park lodge is ranked at the top. If you visit the park you would come out definitely recommending it to another person. The location that the golf course has been set in, is not only gorgeous and beautiful, but also well kept. The maintenance of the grass to the level required is superb and ensures that the golfers have an easy time when they visit here. Located in Jasper, Alberta, the Jasper park lodge has a peak pricing of $239. Located in Banff, Alberta, this golf course is situated in an attractive and spectacular location which is one of the best in the world. The typical weather is warm during the day and freezing cold in the night. The grass is well maintained by the keepers. Banff springs happens to be located within a national park and has a peak rating of $249 which is a bit higher than the Jasper park lodge. Located in Lakewood, Innisfail, Alberta, this golf club is Central Alberta’s number one public golf club. It is one of Alberta’s best golf clubs. It has 3 golf courses each containing 9 holes adding up to 27 holes. The golfing experience here will certainly be the best for any golfer. The club has stiff fairways that wind up through rolling ridges. The grass is arched and more petite than average with most being tarred. It is a great choice for those who enjoy recreational eating and drinking. It has a licensed bar and a barbecue outside. I’d recommend this for those who would want a great golfing experience while also hanging out with friends and family at the same time. It has prices ranging from $200 for children below 11 years up to $2525 for full privilege memberships. A private golf club located in South West of Great Edmonton. It was ranked number 9 in Canada and was ranked the best new golf club in Canada in 2003 when it opened. It is a modern course with a rugged shifting and vital green site. Its holes are pathed along the North Saskatchewan River banks outside Edmonton. It has a beautiful scenery considering the pine trees and the beautiful river valley. It is now ranked 4th in Alberta and 25th in Canada. It is well kept and maintained. I would recommend this for people in Edmonton who just want to loosen up. It has clinics and rates with offers combining clinic fees. It sure is superb. It also has fair rates that are from as low as $16 up to $129 which is where its Membership is rated. This is the best golf course in Southern Alberta. It is an 18-hole course in Lee Creek Valley at Cardston town. It is a beautiful course with a scenic horizon of natural landscape, wild animals and mountains as well. It is good for all kinds of golfers; both experiences and beginners, professionals and amateurs. Its grass and entire vegetation is well kept. The services offered by the staff is great. The staff are also very friendly and nice. The rates aren’t put up for public view but this doesn’t stop it from being a great golf course. This is a golf club at Crowsnest Blairmore, Southern Alberta with a total of 18 holes. It is indeed a wonderful golf club as it was even voted The Most Scenic Course in Alberta. It has a great and formidable structural design that gives splendid variations in elevation together with holes that are really unique in design. The good news is that it is under some renovation where it is being expanded. After the renovation which is right in 2018, we’ll have 2 new holes here totalling to 20 holes. There is also a plan to open 9 new ones in 2019. There is very great reception by the staff right from the point when you enter the golf course. The services are incredible. For the food lovers, you won’t be disappointed as the food here is quite delicious and they are open for all 3 meal courses during the day. The vegetation is well kempt and mowed. I’d recommend this for anyone who truly appreciated and cherishes the gifts of nature and anyone who wants to have a great stress free golfing experience. Here you could easily mix business with pleasure. It has various membership rates going from as low as $295 for juniors to $1595 for seniors and $3085 for a family package. This is the best public golf course in Calgary. It has 18 holes and it offers challenge for both experienced and non-experienced golfers. This golf course has so many facilities including food and beverage and a Pro shop as well. It is a simple but very nice golf course to ensure a wonderful golfing experienced to every golfer. The members of the staff are very nice and this is right from the entrance. The food and beverage service is very nice and they offer all sorts of refreshment. It is a great place to have a golfing experience with friends and family. Located in De Winton, Alberta, is this wonderful golf club. This golf club ranks with the best golf clubs in Canada. It is one of the clubs with 27 holes offering a very awesome experience for both professional and beginning golfers. It has a diverse and antique style of elegance. It has many beautiful gracefully designed holes that are so enjoyable. I’d recommend this for all who would want a private experience at a public golf club as the services offered here are so good with friendly staff. The food is also good. This club goes for a price of $300. This golf course is located in Sherwood Park, Alberta. It has an open square lined with trees. It has beautiful and exquisitely designed holes that provides you with an amazing experience. The services offered by the staff are very remarkable. They offer a very wide variety of foods and you could stay and eat dinner too. The climate is also wonderful and not to mention, the food is nice. It is commendable to anyone who would not mind long grasses and a layout that is difficult to read. I’d also recommend this for anyone who enjoys a good climate. The pricing here is at $125. This course was ranked the best in western Canada in 2002. It is said to be the focus of attention of the village of The Three Sisters Mountain in Canmore, Alberta. It has 18 holes .It is a classic course that is up to date having a breath taking mountain horizon with spontaneous fairways and a rich native antiquity. It also has a food and beverage facility and the food here is very nice. The staff are also very friendly. This golf course has a teaching staff making it a plus point since amateurs and beginners are also taken into proper consideration in this club. Its pricing is at $195. Get a 40% off at Gateway Park Executive Golf at $12 for 2-4 golfers at 9:30 a.m. and 47% off at Lagoon Park Golf course at $24 for 1-2 golfers on Sundays. These courses also have other exclusive offers at other times. Golfing has never been this fun and affordable as it is in Alberta. The most expensive golf course in Alberta is Fairmont Banff Springs golf course. It is even known and termed as the “Castle in the Rockies” which clearly points out that it’s like a “Castle”. Castles are known to be elegant and quite valuable. Rated at 4.6, it is a very luxurious and is well known for its spectacular elegance. Every golfer that has the opportunity to play or spend time here is sure to be swept off their feet by its astonishing view towards all the inclination and its elegant design. Not forgetting to mention its 71 par and 27 holes in total and its academy which has well trained and experienced staff who will teach you and direct you in any area that you need assistance in. It is totally worth all the cash. It is also inclusive of a good restaurant that has very many delicacies. Nothing to worry about if you choose this club as your course. We also like that if you make your way out here, then that means you are in one of the world's prettiest national parks.